You want what’s best for your health, but if you’re not sleeping on a natural latex mattress, you could be inhaling harmful chemicals all night long. A non-toxic sleep surface is important for your well-being and peace of mind, so it’s worth it to check out Sleep Natural. While other mattresses are often built with and emit harmful chemicals, Sleep Natural latex mattresses are natural and non-toxic. We only use pesticide-free plant-based materials and fabrics made in the U.S.A., and we make our mattresses in our own factory. You won’t find formaldehyde, flame retardants, or other toxic materials in Sleep Natural talalay latex mattresses. We simply use organic latex made from rubber tree sap as well as organic cotton and environmentally friendly foams. And since Talalay latex has an open cell structure, it sleeps cool and therefore doesn’t contain cooling chemicals that some other mattresses use. Off-gassing is what happens when chemicals are released under normal pressure from the atmosphere. You’ve probably experienced off-gassing with the smell of a new car or brand new home. In some cases, such as when you unseal a new mattress, it’s harmful to breathe in the released chemicals because synthetic materials used in mattresses contain toxic petrochemicals. In our natural latex mattresses, there are no synthetic materials. Which means you don’t have to worry about breathing in off-gassed chemicals that can make you sick. Quality sleep is imperative to a healthy life. We rely on it to boost our immune systems and keep our brains functioning, so a comfortable mattress is a must in order to achieve uninterrupted sleep night after night. Sleep Natural’s organic talalay latex mattresses provide just enough contouring comfort to relieve pressure and pain, but is also supportive to prevent that “sinking in” feeling that many foam mattresses have which can cause your spine to sag. Better comfort means better sleep — and that certainly leads to a better life. 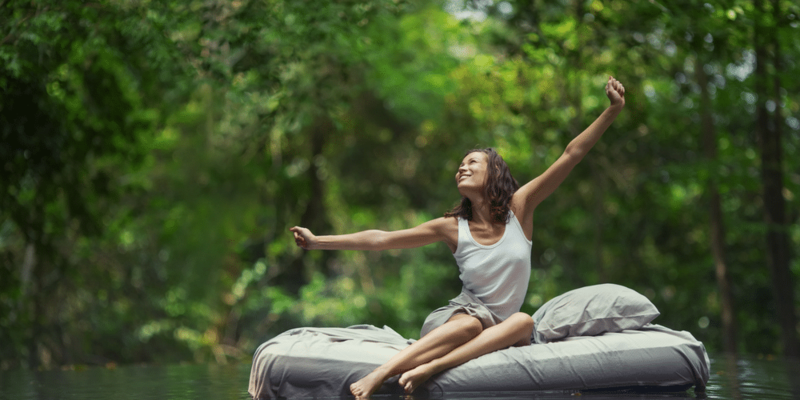 No matter what your sleeping position preference is, how hot you sleep, or what your budget is, there’s a natural latex mattress for you in the Sleep Natural line. With luxurious latex layers, Perfect Temp Technology Quilting, and gel-infused foams, you’ll rest cool and comfortably. And since natural organic latex doesn’t contain harmful chemicals, you can sleep guilt-free for years to come.